Darth Valley Challenge: Darth Vader sprints in Death Valley! Is it as silly as it looks? 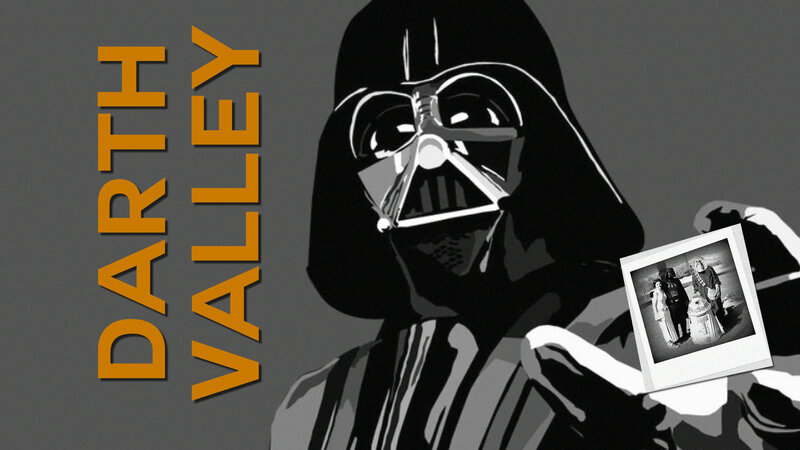 The Darth Valley Challenge is very simple. You dress up in a Star Wars costume, you head down to Death Valley on the hottest day of the year, and you run a mile as fast as possible! 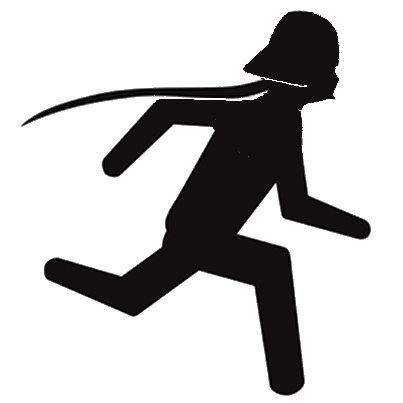 Darth Vader’s record is 6:13 for the mile… in 2013 it was a world-record June temperature of 129F but he still managed 6:36! The numbers on the right represent Darth’s times so far, as a percentage of a 10-minute mile. Lower is better, of course! We agree. Running a mile – even in this heat – is something most people could do. Sprinting a mile as hard as you can, however, is quite tough. Especially at 129F. In black. In a mask that makes it hard to breathe. Come give it a try! When George Mallory was asked why he planned to climb Mount Everest, he replied simply, “Because it’s there.” So why do we do this? “Because we’re idiots,” but it doesn’t sound so good. The DVC is pretty funny. But safety is no joke. No joke. Pushing your heart rate this high, in this heat, could kill you. Jon trains year-round in the sauna to acclimate to the incredible heat. Our strong advice: do NOT try this stunt in extreme heat. Learn more about Death Valley safety here. Death Valley is one of the most beautiful, and dangerous, places in America. In summer the pavement can reach 200F. People die every year due to poor preparation and bad luck. Please see this VITAL information from the National Park Service before visiting in summer. When the ambient temperature is higher than your body’s temperature – 98F – then the body cannot radiate heat and sweat will not evaporate. Instead of cooling, the air around you increases body temperature – quickly resulting in dehydration, heatstroke and eventually death. If you truly want to try extreme temperature running, please visit Heat Running for some useful ideas on training and safety. It could save your life. “If you thought pod racing could be extreme, wait’ll you hear this! In Full Sith Lord regalia, Rice dresses as the dark father, and proceeds to run through Death Valley at the hottest part of the day. The force was with him. It must have been, otherwise he’d be dead. Jonathan Rice tapped into his inner dark side and ran a 6:36 mile in Death Valley on June 30th, a day when temperatures climbed to 129 degrees. He wore a Darth Vader costume, I’m guessing, because why not make this a little crazier than it already is? Land of beauty, serenity and peace. Oh, And death. Can't forget about the death. The Dunes are beautiful and photogenic, especially at sunset – but they are much harder to hike than they look, and those big dunes are not just over the next hillock! Hike with extreme care, take plenty of water, and plan for at least two hours if you intend to get to the biggest dunes. Furnace Creek is pretty much the only game in town – yet it’s managed extremely well by Xanterra, a company that has actually made it their mission to provide great customer service, environmental sustainability and affordability. The food is a little pricey, but it’s usually pretty good. The rooms are basic but comfortable. And the showers are hot when you want them cold. Nothing’s perfect. The pool is fantastic though! 18 miles south of F/C on Badwater Rd. The Badwater Basin is home to the lowest point in the United States, at 282 feet below sea level. There is a wonderful stroll out onto the plain for half a mile or so, after which the true nature of the salt pan reveals itself – brittle salt formations that perch atop scalding water. As always, bring water and let people know where you’re going and when you’ll be back! This stunning 9-mile loop climbs approximately 1,100 feet in the first mile-and-a-half… making it a pretty tough run in 120F heat! Spectacular views across the salt plain await you, followed by a roller-coaster through the foothills. Borax mining was never glamorous, seldom successful, and probably didn’t make the 20-mule teams very happy. But at Harmony you can see some of the remnants of an 1883 mine and its equipment – an easy jaunt down the street from Furnace Creek, on a paved footpath if you happen to be in the mood. Remember that many other mines in the area are extremely dangerous and prone to collapse. Big holes in Death Valley are rarely good news. 30 miles S. of F/C on Dante's Rd. Although it takes a little effort to get up to this elevation, the views are truly spectacular – especially in the evening, when the sun sinks directly opposite you over Telescope Peak. Zabriskie Point is the bustling tourist center of Death Valley – but it’s worth the crowds for the view. Colorful rock formations leap from the ground, glowing in vibrant hues at sunrise and sunset (although they can be lost in full sun). Below is Gower Gulch, leading to Golden Canyon – a wonderful hike for highly-experienced hikers who know how to read a geological map. 53 miles N. of F/C on Scotty's Castle Rd. Strange stories about ‘Death Valley’ Scotty and his friend Albert Johnson (who may or may not have been swindled into the deal) have always added to the mystique of this virtually self-sufficient desert hideaway, completed in 1939. Scotty himself was known as an inveterate… let’s say exaggerator… while Albert’s wife Bessie was known as the money. Between the three of them they created an enduring Death Valley legend, and a great side tour for visitors to the National Park. The ‘World Record’ Hottest Mile? Although Guinness decided that it would be ‘too hard’ to qualify future attempts, we believe that the 129F 2013 mile was the hottest ever run by a human being. To begin with, 129F ties for the hottest day on earth in modern times. (Christopher Burt of Weather Underground also strongly suspects that the 131F and 134F – the current record holders – at Greenland Ranch in the 1930’s were erroneous.) Secondly, there is no suggestion that anybody was out running back then. To the left is the edited version – below is the full, rather dull video. It’s not as much fun as the others as I had it shot purely to demonstrate to the record-keepers that I did indeed run the full distance. Also, here is the GPS record of the run, for those who are interested. ‘Darth Vader’ means ‘Dark Father’ in Swedish, or something. Which must have really ruined The Empire Strikes Back for people in Stockholm.